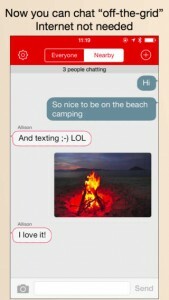 If FireChat sounds like an app that promotes fireside chatter, it’s because that’s essentially what it does. Created by Open Garden, the app takes advantage of the Multipeer Connectivity Framework embedded in iOS7. The mesh network allows the app to connect nearby phones – even when there’s no internet. So, the next time you are in the mood to send a message, and there’s no wireless, just enable the “Nearby Chat” mode. If they are within 30 feet of another user, the app will start sending messages from one device to the next – creating a chain of linked messengers out of smartphones. This is good for ad-hoc walkie-talkie action, sports arenas, music concerts, Burning Man, or even if you’re in a natural disaster and there’s no reliable service.